As the impending war drew closer, the newly independent states needed to raise and supply an army capable of defeating a major world power: Great Britain. Originally defended by the local militia, the former colonies established the Continental Army in April of 1775. George Washington was named the Commander-in-Chief and the leaders set out to build an army that could defeat England. Despite major obstacles, the former colonies were able to build an army. The major advantage for the Americans came from their knowledge of geographical features within the colonies. Geography played a major role in many of the battles of the American Revolution. How did geographical features affect military strategy during the Revolutionary War? After completing the Written Document Analysis graphic organizer, students should answer the following questions with evidence from the document. What is the overall purpose of this document, and what evidence does the author provide to support his argument? What considerations about order of battle would military commanders need to make based on the geography of the land? How is this shown in the document? Order of battle for the army commanded by Major General Sullivan; order of marching and order of embarking and debarking, with diagram, August 29 1778, battle of Rhode Island. Examine the map. What do you believe this is a map of? What evidence makes you believe that? Research various battles during the American Revolution. How does the order of battle provided in this document compare to those in other battles? English Language Arts: Imagine that the battle has been successful. Write a letter from the perspective of the author to the Continental Congress explaining how the order of the battle helped with the victory. 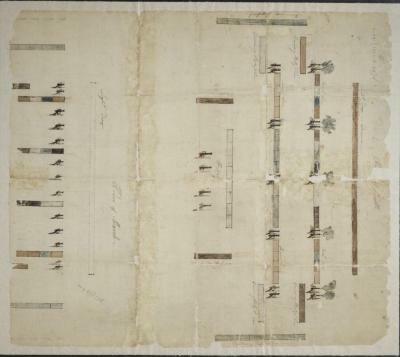 Art: On separate sheets of paper (for the order of the march, embarking and debarking), draw out the moves made by each group of soldiers based on the text. Science: Research the technology of weaponry used during this time period. How does this technology impact the decisions made for the order of the battle? Regiment to flank the reserve on the left. The first and second line as Represented in the annexed Plan for and up march. To take ground in the Manner Represented in the order of March upon the annexed plan. The Light corps to have two Light Brass Pieces Immediately on Landing to March forward. Passes themselves off the high ground Before the place of landing & covers the Main Body while landing and forming immediately upon Landing the first Line to form In Order of Battle and Move on to sustain the Light Company. The Second Line & Reserve also B forms and sustains them. Should the Enemy attack in flank the flanking Division to which form The line sustains the attack till Reinforcements. Should the enemy in the course of the engagement Endeavor to turn on right or Left & appear to have a Line further than expected to right or left than the Covering Party is to march up & Line up there and the whole Onto much of the Flanking Division. Display outward as will extend the [ ] equal to that of the Enemy & prevent his turning our flanks. Should The Enemy attack either of our flanks on the March. The flanking divisions are to wheel outward and sustain the attack till reinforcements and if the enemy that attacks the rear appears to be in front of the flanking divisions of the rear will endeavor to gain their flanks. When the army draws up in order of battle the flanking division will wheel up form a line face outward & wait for further orders. It is Positively ordered that the several Corps in their march hold their stations during their march agreeable to the [ ] [ ] on the Map entitled the order of march and that in Drawing up they take and hold the ? assigned them agreeable to the order of battle represented in the annexed Plan and that they do not deviate from it but by special order or by absolute necessity. It is particularly required that officers commanding Brigades and other Corps take care to preserve the distance between the columns that they may have room to display and form the line without complication. As from our numbers the justness of our cause and the assistance approved us by the [ ] troops who are to cooperate with us have the strongest reason to expect victory. It is not doubted that every man will earn himself to deliver his country from an inhumane enemy. To require the glory due to his bravery thou Britons who have so often Stigmatized them as cowards. The [ ] positively command every superior officer to inform him as soon as possible after the action of those officers and men who may remarkably distinguish themselves that he may reward them according to their merit. He commands the [ ] silence & entered the troop not to suffer themselves to break their orders or to be led into hurry and competition. Firmness and silence being the two great necessities for obtaining victory. Though our numbers and disposition [ ] and Providence to impune victory yet the general wishes his troops not to expect an easy conquest. Most expect to purchase victory with bravery & firmness. A victory without an opportunity to display our valor can afford us but little honor. The general earnestly entreats his brave brethren whom he has the [ ] to command to be ready.